Ferrari 458 Tuning: The Ferrari 458 is no shrinking violate, in fact it’s a bit of an animal, but that does not mean there is not a little room for improvement. Its time to go all VIP Design on you! Is it time to go faster? To be fair, on a normally aspirated car like the 458, the tuning is not all just about max BHP, it’s what people want to talk about of course – but its not where the action is on this occasion. N/A Ferrari tuning is all about 2 thing: the throttle response and availability of the power into the midrange RPM. The goal of the VIP Ferrari 458 tuning, is to make the throttle more responsive sooner in the rev range, to bring the power in sooner and keep it pulling well into the midrange rpm. 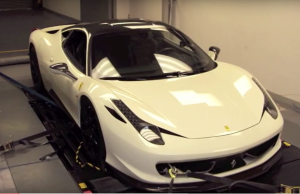 The VIP Ferrari 458 tuning and remapping is race endurance tested. We of course add a pair of high performance free flowing air filters that also give a crisp induction sound on acceleration. The full Ferrari 458 tuning and performance pack is shown here fully fitted at our workshops, but if you can’t get to use we can arrange mail order shipping too. We also have wheel and tyre packages and a full range of custom services, including carbon dipping, upholstery and trim work, etc.